Be the first to share your favorite memory, photo or story of Mary Lynn. This memorial page is dedicated for family, friends and future generations to celebrate the life of their loved one. 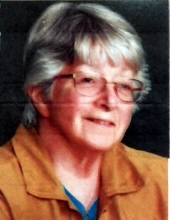 Mary Lynn (Okerlund) Kaczka, 71, of Magnolia, DE and formerly of Curwensville, passed away Wednesday March 20, 2019. Born November 30, 1947 in Clearfield, she was the daughter of Lawrence and Marjorie (Gallup) Okerlund. Mary Lynn was a graduate of Curwensville Area High School, received her Bachelor’s Degree from Indiana University of Pennsylvania and her Master’s from the University of Delaware. She was a math teacher and Department Chair for Caesar Rodney School District retiring in 1999. She was Past President of Piece Makers Quilt Guild, member of Helping Hands Quilt Guild, National Council of Mathematics Teachers and Farm Bureau Quilting Friends. Mary Lynn volunteered at Interfaith Men’s Mission and Orchard Church Praise Team. Surviving is her loving husband of 23 years Anthony Kaczka, a brother Kenneth Okerlund of Clearfield, a sister Susan Thorp and husband Kenneth, nephew Tracy Thorp and wife Vicky both of Grampian, niece Pam Tarachak and her children Harrison and Ava all of Pottstown as well as extended family and friends. The family suggests contributions be made to either the Orchard Church P.O. Box 256 Magnolia, DE 19962 or 88.7 The Bridge P.O. Box 680 Milford, DE 19963. Online condolences may be made to the family at www.chidboyfuneralhome.com or www.pippinfuneralhome.com. To plant a tree in memory of Mary Lynn (Okerlund) Kaczka, please visit our Tribute Store. "Email Address" would like to share the life celebration of Mary Lynn (Okerlund) Kaczka. Click on the "link" to go to share a favorite memory or leave a condolence message for the family.